We frequently talk about the potential for a slew of emerging and traditional mobility options, yet most of these get bogged down in limitations induced by car-centric planning. Tactical urbanism is a grassroots, activist trend that has evolved to fill this gap. The roots of tactical urbanism lie in community members finding ways to make their voices heard in places where they feel local officials do not consider their needs. This approach offers a novel way for mobility managers to explore how they help their customers access what they need. Tactical urbanist interventions – redesigns of spaces to change how people use them – are frequently used to highlight ways in which spaces can be made safer and more comfortable for the people living in them. These types of interventions could translate well into the process of reimagining transportation networks to better serve local community members’ needs. An important aspect of tactical urbanism is that community members traditionally take interventions into their own hands. By forcing change in how people use public spaces, it shows them the potential of what the spaces could be. Sneckdowns, islands of fallen snow or leaves that form in streets from traffic patterns, provide a resource for tactical urbanists to visualize potential new uses for a space. 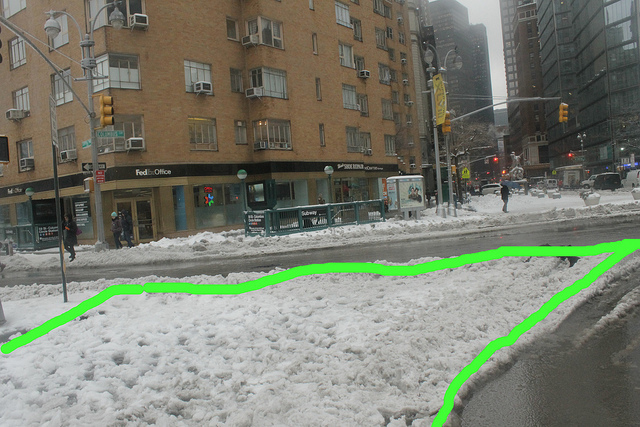 Some tactical urbanists have taken it upon themselves to “enhance” the sneckdowns. A great example comes from Toronto, where a neighborhood resident redesigned an intersection that both better controlled traffic and showed where more space for pedestrians could be built, just using chalk and raking the leaves into a new space. A recurring, and effective, tactic that has popped up has been for bike advocates to glue toilet plungers to the street to create protected cycle tracks. Though most cities remove these interventions quickly, some occasionally accept activists’ visions right away and officially design protective barriers into the spaces. It’s telling that a number of communities, large and small, have begun to officially embrace the spirit and strategies of tactical urbanism, integrating it into their planning efforts. The cheap, easy-to-modify interventions provide a low-risk way of creating safer streets and improving the quality of a variety of mobility options. The practical side of tactical urbanism also give planners the opportunity to test new design interventions of streets or intersections cheaply and flexibly. Equipment deployed for one test can be repurposed as soon as agencies have gathered the information they need, such as Boston’s use of traffic cones to study a potential dedicated bus lane. Instances like the Boston bus lanes also show how agencies can use tactical urbanism’s strategies in their own processes to improve the mobility network without waiting for the public to suggest an improvement. These also give agencies highly visible rationales for their decisions that the public would likely trust far more than a behind-the-scenes traffic analysis, since the public both sees and interacts with the change and can provide feedback on an actual experience. This improvisational mindset also helps communities implement some changes faster than they could through traditional processes. Especially by collecting data to support an intervention, official tactical urbanism can uncover immediate benefits that would support lasting changes, making streets safer for all users immediately. Beyond making design decisions more flexible for planners, sanctioned tactical urbanism empowers community members and engages them in creating the space that they feel best suits those using it most directly.